A new survey by TransUnion reveals differences in how men and women are planning to tackle holiday credit card debt. We analyze how these factors play into the bigger picture of credit cards in the holiday shopping season. A new TransUnion (NYSE:TRU) survey suggests men who use credit cards to pay for holiday shopping are more confident about their ability to pay it off quickly than women. When asked when they anticipate paying off their card upcoming purchases, 61% of men answered with “within a month”, compared to just 42% of women. At the same time, men are more likely than women to use a credit card this season. Over three out of four men said they were likely or extremely likely to use a credit card. Just two thirds of women shared the same sentiment. The differences between genders are generally in-line with some past findings which showed that single women are more inclined to carry more debt, as a percentage of their total income. A 2014 study by the American University reported debt-to-income ratio for women neared 140%, while at the same time hitting little over 110% for men. The TransUnion survey revealed a similar divide in holiday credit debt between those with and without children. Close to 60% of individuals without children expect to pay off their holiday credit card debt within the first month. Those with one or more children think it will take longer, with just 46% reporting they will pay their debt off the same month they charge it to their cards. These results are less surprising, as children generally introduce financial stressors to household budgets. A study by the US census showed that childcare costs rose 39% between 1990 and 2011. As families deal with these expenses, they are likely to supplement their total budget for non-essential purchases with credit cards. Experts expect spending and debt to ramp up in the 2016 holiday season. A separate survey by CouponCabin.com found that a quarter of Americans will find themselves in debt this year due to holiday spending. At the same time, the National Retail Federation estimates that the average US consumer will spend roughly $936 – up 16% over last year. Credit card debt has been a growing problem in 2016 for both men and women. As of August, the average indebted household has over $16,000 in balances across their cards. This is up roughly 6.2% since August 2015. 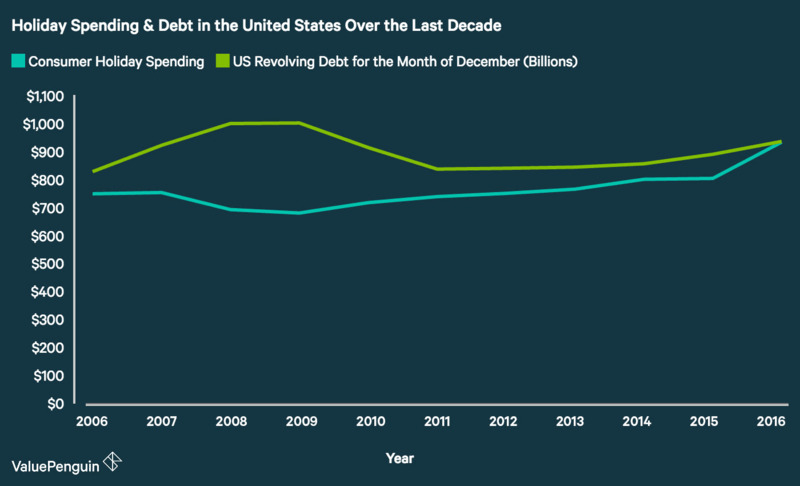 All-in-all, the total revolving debt in the US is at $975B, according to data collected by the Federal Reserve. These figures are beginning to reach heights not seen since 2009/2010. Luckily for those in debt, the Fed has decided to not raise interest rates for their time being. The current federal funds rate sits at about 0.5%, while the average interest rate on credit card accounts is approximately between 12% to 14%. An individual making just the minimum payments on their 2016 holiday debt of $936 would be charged $233 over two years. Due to the way credit card debt works, individuals who make their purchases in the coming weeks are unlikely to be affected even if the Fed raises interest rates in December. Changes to the interest rate can only be applied to future balances. Therefore, if the Fed’s decision causes an interest rate to move up from 15% to 16% on December 21st, the new rate will only apply to purchases made on or after December 21st. This rule stems from federal laws that protect consumers from arbitrary or unexpected increases in their interest charges. Consumers who expect to become indebted have the opportunity to take advantage of low interest offers available on the market. The recent credit card wars between major banks apply not only to rewards programs, but to interest rates as well. It’s no longer uncommon for cards to come equipped with 0% interest for 15 or 21 months from account opening – these introductory periods would have been unheard of just a few years back.